Substitute sees red for moment of madness. 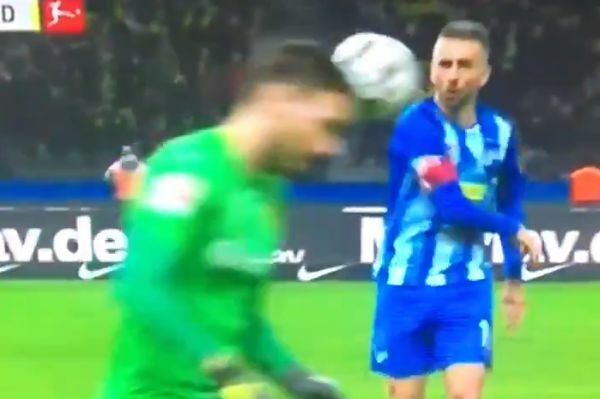 Hertha Berlin’s Vedad Ibišević received a straight red card for throwing the ball at the head of Borussia Dortmund goalkeeper Roman Bürki on Saturday. The Bosnian forward had been brought on as a substitute but, rather than helping his team to claw back a result, his 95th minute sending off reduced them to nine men. Marco Reus had given Dortmund a 3-2 lead at Hertha’s Olympiastadion just minutes earlier in a game in which Jordan Torunarigha also saw red. Former Chelsea winger Salomon Kalou had twice given the home side the lead in the first half, scoring either side of Thomas Delaney’s goal for Dortmund. Dan-Axel Zagadou then equalised for the Bundesliga league leaders just after half-time, with a flurry of late action culminating in Ibišević’s moment of madness. Whether or not he intended to hit Bürki’s head with his throw – it makes contact only after the goalkeeper stoops – his act of aggression was enough to be given his marching orders.